The following is a personal review of my experience with DuPage Medical Group… I should note here that I am in not receiving any form of compensation whatsoever from DuPage Medical Group for writing this review. When my primary care physician joined DuPage Medical Group two years ago, I followed. The new patient intake process was fairly simple and involved little more than filling out some standardized personal/medical information forms. The facility I go to is located in downtown Glen Ellyn and is very new, clean, and convenient. 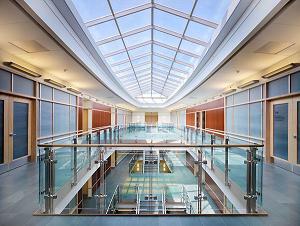 Interior view of the new DuPage Medical Group Office in Glen Ellyn. After two years as a patient, I have found that DuPage Medical Group provides excellent care and service. On three separate occasions in the past two years, I have had to make last-minute appointments. Each time this has occurred, I was able to see a doctor that same day. On two of those occasions, my primary care doctor was not available. The scheduling staff, however, was able to setup appointments other physicians in the group. I was happy with the quality of care I received on both of those occasions. It is often difficult for me to get in to see the doctor due to time-constraints and a full-time work schedule. The biggest benefit I have found with transferring to DuPage Medical Group as a patient is their flexible availability. There are regular after-hours appointment times available as well as Saturday hours (there is no additional cost associated with these conveniences). For me the schedule conveniences is a huge plus for DuPage Medical Group. I have not had this experience with any other practice or medical group in the area. In addition to me, my young children are also patients with DuPage Medical Group. Transferring from their existing pediatrician was a difficult decision to make. However, I am very happy with the decision. If you have children, you know they get sick and often at the most inopportune times. Once again, their convenient hours and appointment options have made this a no-brain-er for me. Anytime I have called them before 3PM, they have been able to see my sick child that same day. In the two years that I have been taking my children there, we have seen five or six different pediatricians. All of them have been excellent with my children and provided quality care and attention to whatever was ailing them at the time. It is clear that this group understands our busy lifestyle in DuPage County and they have catered to that need successfully. In my opinion, DuPage Medical Group provides excellent care and service. I am a very satisfied customer and patient.